Over 15,000 people will assemble on the Quadrangle Monday. 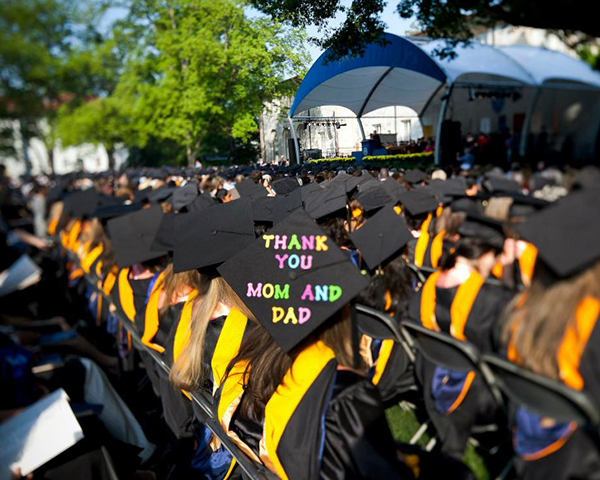 2014 Commencement is on Monday, May 12. As part of our effort to reduce the negative impact of traffic and critical parking constraints, we ask your help in actively assessing your workforce and identifying staff members who do not need to be on campus on the morning of May 12 except for mission-critical or Commencement-support roles. Formal or informal telecommuting, home assignments, or flexible schedules are possible alternatives. For staff members who must report, please encourage organized carpooling. Every car removed from the streets, decks, and lots makes a significant difference for the graduates and their families. Your active encouragement and support of this effort will signal to staff that this request has the endorsement of Emory’s leadership, including the cabinet. Such flexibility also contributes to the quality of a day that is special to our many visitors. This entry was posted in News and Events and tagged Commencement. Bookmark the permalink. Post a comment or leave a trackback: Trackback URL. Absolutely staff should do everything they can to reduce cars on campus for Commencement. But Commencement is the culmination of our work here. It is the great outcome of our efforts. It’s why were here. Find a way to get to campus without a car and get to the ceremony. AND – Volunteer to help!